Phoenicia. Tyre silver shekel (30 Pieces of silver type). Shekel of Tyre. - 30 Pieces of Silver Type. 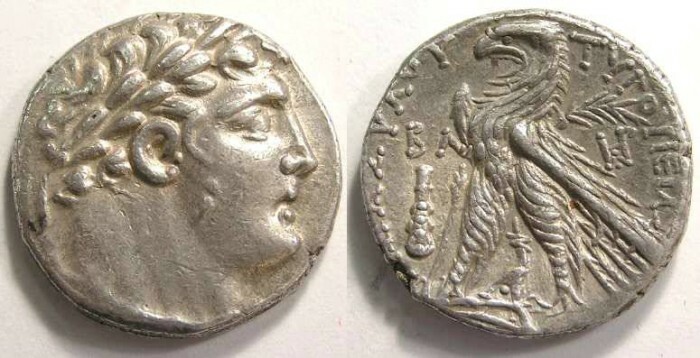 Denomination : Silver tetradrachm (Shekel). Size : 27.2 x 27.7 mm. Weight : 14.33 grams. Obverse : Head of Melqart right. Reverse : Eagle standing left on a ship's prow, with a club and the date mark in the left fields, a Greek letter monogram in the right field. and a Greek inscription naming the city of Tyre around.